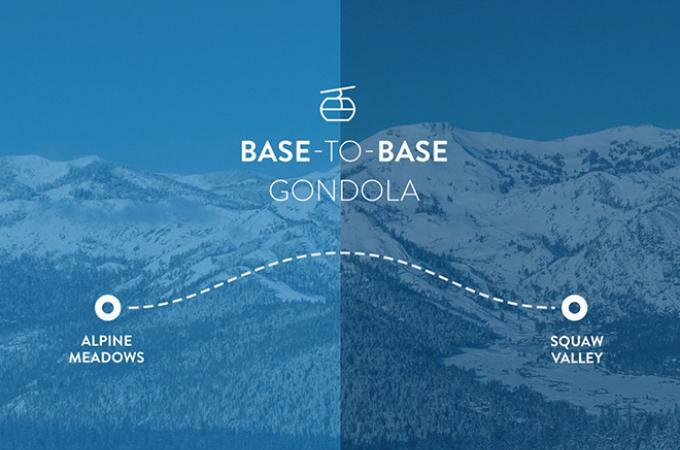 Ever since KSL Capital Partners, the owners of Squaw Valley Ski Holdings, purchased neighboring Alpine Meadows in 2011, it has been a dream of SVSH President and CEO Andy Wirth to realize a longheld dream for the region and connect the two mountains with a base-to-base gondola. Fortunately for Wirth, the owner of the private land between the two ski areas and the key to any interconnect — Troy Caldwell — shared his vision. Today, the two announced that after four years of trying to make it work, they finally did. In what both Wirth and Caldwell hope will be a game-changer for skiers not only in Tahoe and California but potentially in all of North America, the Squaw-Alpine interconnect, which will unify 6,000 acres of skiing into one experience, will be a high-speed, detachable gondola made up of three segments that can operate as a single unit or separately. Segment A will stretch from the base of Squaw Valley near Cushing’s Pond to the top of the KT-22 ridge, segment B will travel from the ridge over Caldwell’s property to Barstool Lake on U.S. Forest Service land, and section C will take skiers from Barstool Lake to the bottom of Alpine Meadows in an exact location yet to be determined. Each segment allows for loading and off-loading, so for instance skiers could use segment A to reach the KT-22 ridge and ski back to the base of Squaw, or during high wind events A and C could still run while B is closed. The gondola will be bi-directional and operate in a continuous loop.